Number is the intense and brutal opener of the album, and definitely one of the songs I enjoy the most to listen to. Serving much of the same purpose as Libre did on Ashes, it’s definitely a statement to kick off the album with a blast like this. The first vocal part of the album is growls, and these vocals remain quite prominent through the whole song. Number is also a good opener considering that it is quite representative for the vibe of the album. A digression: Both me and Tarald are huge fans of Kiss from the 70s and strongly disagree when it comes to the period 1979-2013 (with ‘The Elder’ being the only exception). After fast and aggressive riffing in the growling verses, Mariangela introduces herself with a classical and powerful vocal expression in the chorus. The song features a bombastic and suggestive mid section before chaos builds up again. After adding the extreme vocals towards the end of the song it suddenly reminded me slightly of the Norwegian band Solefald (yup, another personal favorite of mine). Darkest White is brutal in its nature, yet very catchy. The verses include quite harsh and distorted vocals by Kjetil and the growling takes over in the chorus. As mentioned in the last part of the studio report, we started the guitar recordings with this song. I remember flying high after listening to the new recording with the amazing guitar sounds Christer had created. The shouting choir in the chorus is a mixture of vocals by Kjetil and me. Like with all of these new songs, I love Tarald’s lyrics for this one. The title was early suggested as an album title. This is the first piece of music we have presented from the album. The feedback has been quite overwhelming. Himmelfall is the first Tristania song to date with a Norwegian title. The song features some amazing vocal performances by Mariangela and Kjetil. Kjetil does some really cool low-pitched lines in the verses and Mariangela shines in the choruses where she is doing really powerful stuff. I think Himmelfall will be a great song to include in our live set. It has a nice heavy and bombastic feel that goes through the entire song. We started to rehearse a live version of it for the upcoming festivals, and it really sounds promising. Some of you probably already know Requiem, as we played it live on our European tour last fall. The live reception was really promising, and I’m very happy with the final version. In a perfect world one should play all songs live before entering the studio. It is always useful to try out new material for the first time on an audience, and it’s definitely an advantage for the actual recordings. After playing a song a hundred times on rehearsal and in concerts they tend to creep under your skin (if it doesn’t, you should probably find something else to do). I’m very pleased with the final recorded version on the album. I think it turned out nice and groovy in the verses and really powerful and bombastic in the choruses. Mariangela sings the lead vocals on this one, and the chorus features backing vocals from Kjetil and Ole. This kind of harmonies is one of Ole’s most important contributions to our sound on both Rubicon and Darkest White. 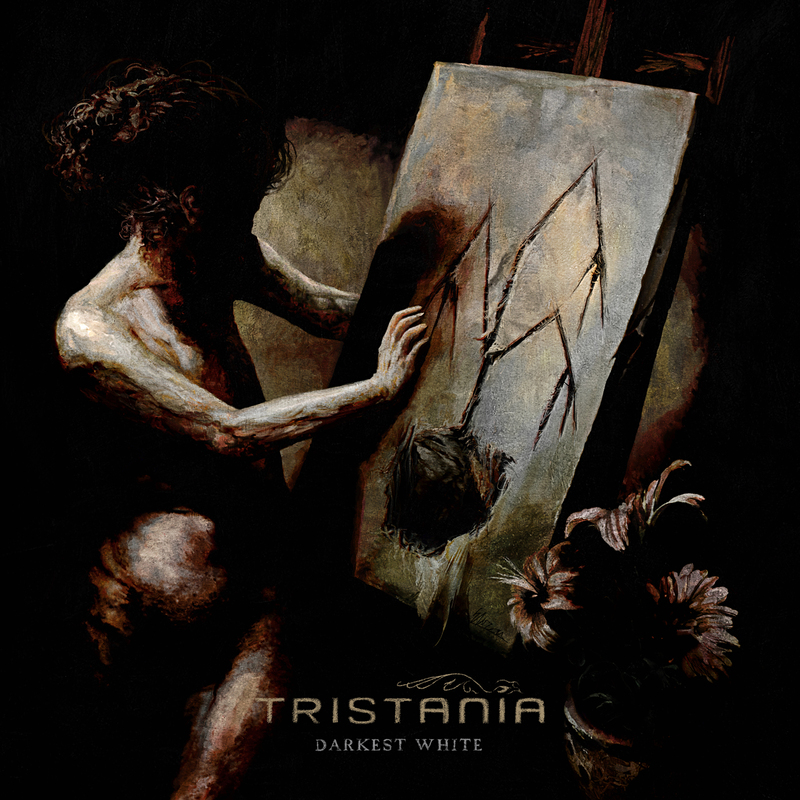 It’s a privilege to be in a band with so many great singers, and these powerful choirs have become one of Tristania’s biggest strengths also live. However, I have to add that there are fewer choruses like this on Darkest White compared to its predecessor. Kill Your Darlings is a well-known phenomenon in music production, and on several parts of the album we either had to skip harmony voices or mix them very low. The only reason for this is the extremely high standard of the recorded lead vocals. On several songs we dropped harmony voices in order to give space to the feel and the nerve of the lead vocals. Requiem features one of my favorite growling parts on the album. Diagnosis ended up being one of my absolute favorites on the album. I like to think that this is how it would sound if a band like Sigur Rós would make a metal song. We were not 100% confident with the demo version of this song. I remember me and Ole discussed how to do something special with it during the recordings. Luckily, we managed to do so. I love Christer’s production and the guitars provide a nice doomy and heavy feeling. Diagnosis is the first Tristania song where the guitars are tuned as low as C.
It also features outstanding lead vocal performances by both Mariangela (verse), Ole (bridge) and Kjetil (chorus). This was one of the first song ideas for the album that Ole came up with and one of the first three finalized songs. Speaking of killing darlings: In this song we decided to leave out a progressive part, made by Ole, that we called ‘The Mastodon part’. I really liked it, and hopefully we’ll make a whole song out of it in the future, but it didn’t quite fit with the rest of the song, especially after Kjetil came up with the chorus vocals. Scarling is the only song that wasn’t 100% finished when the recording sessions started, thus the last song to be completed. The general 6/8 feel of the song changes into 11/8 during the verses. A lot of time was spent composing vocal melodies linking it all together to make it work optimally. We feel that we succeeded in the end. The verse vocal lines were made by Kjetil, whereas the chorus and the bridge melodies were added by Mariangela. Scarling is definitely one of the gloomiest tracks on the album, and I have a feeling that this will be a song people either love or dislike (like Magical Fix on our previous album). Night on Earth was written by Ole and me during a composing session we had in my apartment in Stavanger last summer. I remember it was one of the rather few summer days we had in Stavanger last year. We started the session with barbecue and beer in the garden before we went inside and made one of the darkest and gloomiest songs on the album. Growls are the main vocals and Mariangela came up with some really powerful vocals for the chorus. The main riff in this song is a groovy one – the kind of heavy groove that originally was invented by Black Sabbath and later refined by bands such as Metallica and Slayer. I have a feeling that this one will be a live favorite on future shows. Lavender is the ballad of the album. It starts up really mellow with just a single guitar and drums, but builds up and ends quite powerfully. Mariangela and Kjetil are singing one verse each and Ole is doing the vocals in the choruses. Lavender offers a certain atmosphere that somehow is related to the song Amnesia (Rubicon), yet different. Cypher is a song that stands out from the rest in many ways. It’s basically a one chord song and all about creating an atmosphere and building up the mood and intensity. I remember playing this to Einar for the first time. He liked it, but felt that there was too little progression. As he – quite precisely pointed out: “This is one of the few areas in music where you and I differ”. Einar and I share many favorite artists, such as Radiohead, Pink Floyd, Portishead, Björk, Nick Cave. During the years, I’ve tried to convince Einar about the genius of artists like Godspeed! You Black Emperor, Mogwai and Arab Strap, without much luck. Seeing Einar walking away in the middle of a fabulous Mogwai concert at a festival in Stavanger last summer – due to boredom – made me realize that I might as well stop trying to sell these artists to him. Cypher is a song that went through quite radical changes during the pre-production. In fact, we left out big parts of the song and made it much simpler than the original version. It used to have a lively chorus in G major (!) which was nice, but somehow crashed with the dark ambient atmosphere which was set from the opening note. While Ole, Christer and I were working on new parts and elements to go with this mood, it came to mind that this monotony and suggestive effect that the repeating simplicity of one chord offers, reminded me of the American band Swans. Before Tarald came up with the final lyrics we used to refer to this one as The Swans song. The vibe of the song can also be regarded in connection to Tristania tunes such as Shadowman and Fate. Kjetil came up with this great vocal line during a session the two of us had in Stavanger last year. It’s a very simple melody that really allows him to shine as a vocalist. The song keeps building up for almost 6 minutes, and ends up quite intense and majestic. More is more! The final track, Arteries, is another personal favorite of mine on this album. In my first suggestion for running order, this was one of the two candidates to kick off the album. It starts with a blast and the intensity is kept up through the whole song. It made totally sense to frame the rest of the album between the two brutal and intense songs Number and Arteries – both proper representatives for the edge end power that is typical for this album. Kjetil is doing lead vocals in the powerful choruses. Some of you might now that Kjetil is extremely good at covering Faith No More songs (he has a great FNM-cover band together with (among others) Jonathan (Sirenia/ex-Trail of Tears) and Runar (ex-Trail of Tears). I think his admiration for Mike Patton really shines through in the chorus of Arteries. The song is one of the hardest Tristania songs ever, and growls are the most prominent vocals throughout the song. The album finale is a grand outro with a rather complex vocal arrangement made by Ole. The nature of this song changed quite drastically during the pre-production, but no new parts were written. It was all about changing the structure. For instance: The intended chorus (lead vocals by Ole) ended up being a bridge and the intended bridge (Kjetil) became the chorus. The nature of the growls (sounding like a homage to Vorph’s extreme vocals on the Samael album Ceremony of Opposites (1994)) made this song dark and intense. This entry was posted in News and tagged Arteries, Bonus track, Cathedral, Cypher, darkest white, Diagnosis, himmelfall, Lavender, Night on Earth, Number, report, Requiem, review, Scarling, tristania. Bookmark the permalink.